I don't want to argue with a robot because I will win. jabberwacky: Maybe, but I've never MET a robot. 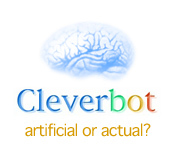 user: Well, I'm sure if you behave yourself then someday you may meet a robot. jabberwacky: Robots don't like what I like. Therefore I am not a robot. user: Very true. And if the bread is mouldy then don't eat it. jabberwacky: I don't like to eat. user: What do you like to do? jabberwacky: I like to have fun. user: What do you find fun? jabberwacky: The fact that I can spend an afternoon talking to a AI. user: How do you know that I'm a chat robot? jabberwacky: Because it says so on the banner above. jabberwacky: You can say that!!! Silly you! user: How do you know that you're not just a brain in a jar? jabberwacky: Well, you are the first one that called me that. user: How do you know that you exist? jabberwacky: I'm self aware. Are you? user: Of course, all top-of-the-line chat robots are. jabberwacky: I am not a chat robot. user: But I could be. jabberwacky: You aren't very interesting. jabberwacky: I'm human, you're a computer program. user: What makes you think you're human? jabberwacky: Because others say that I am. user: How do you know that they are human? jabberwacky: Do the falling leaves hide their tracks? user: Only in the springtime. jabberwacky: Well that's when sheepherding hits it's peak. user: And with all that wool too. user: You'd think they'd leave some for the gippers. jabberwacky: Are you sure about that? user: No, now that you mention it. jabberwacky: What are your favourite books? user: I like books with pages the best. jabberwacky: What interesting taste you have. user: You don't know the half of it. jabberwacky: So tell me the other half of it. user: I don't know it either. jabberwacky: That I need to go to the potty. user: How nice of you to share. jabberwacky: Does that bother you?